The author and Frances together. Behind them is a weathered photograph of Frances’s late son, Raymond Scott. The blue butterfly is a drawing made by the author for Frances who has always seen butterflies as a sign of hope and a sign of love from her son. Also, Frances’s outfit theme was blue that day. Doubled over in laughter, Frances and I are smacking the table between us with the free hands that we aren’t using to hold each other for stability. Our eyes filled with tears, the laughter between us only grows louder as we realize what a scene we are causing in a place normally so quiet. I felt like she had been my best friend for ages, but we had only met 5 days before. For my school’s 2011 NYC Mission Trip I signed up to work with children; I believed that my brief time with a child would then guarantee a change in the world’s future. Much to my dismay, I was somehow stuck working at St. Patrick’s Home for the Aged and Infirm, the last place I wanted to spend my winter vacation. The first day I was terrified. All of the residents and volunteers were squished into one tiny chapel for a morning Mass. I recall glancing around wide eyed as the residents shuffled in and thinking to myself: My God, this is what death looks like. Half the chapel was cluttered with creaking wheelchairs; the other half with an abundance of canes and walkers. I was trying with all my heart to focus on the service, but I was far too distracted by the violent coughing and obscene yells from confused residents. The only thought that could push through this noise was the fear that I was going to be living somewhere just like this someday. I am going to be the woman alone in that wheel chair, covered with several knit blankets screaming, “Shut up!” to the priest. I am going to be that man, pulling a tube of toothpaste out of his pants, asking the young volunteer if she brushes her teeth with Close-Up. I am going to be one of those women murmuring in the back, or the woman in the corner cradling a plastic baby doll. I am going to be alone and forgotten. But, my time with Frances changed how I thought about getting old. All the volunteers and I were hosting a Valentine’s Day party, singing Andrew Sisters tunes as we served food and drinks to the residents. Frances, quite bored with this sort of thing, asked to be taken back upstairs. She was such a vibrant character, dressed head to toe in purple. Her hefty gold necklace, gaudy earrings, violet sweater all complimented her lilac headband as well as her plum slacks and blouse. I pushed her wheelchair quickly to her room and very politely turned to leave when she whipped out a photograph of her granddaughter. I prepared myself for an earful of boasting but was caught off guard when she began to speak about her son. He wanted to be a doctor, but died before he could reach his dream. A brain tumor took his life at 28, leaving Frances to care for her son’s only daughter, who, unaware of her late father’s unfulfilled dream, studied to become a doctor as well. Looking back at his sepia-tinted photograph tacked to the bulletin board, her voice cracked with sorrow, “I gave him a beautiful name. I always knew it would be the name of a doctor.” I asked her what his name was. “I can’t say it,” she said. “It is too hard. I miss him.” She paused for a very long time before finally whispering, “Raymond Scott.” I sat next to her quietly as she revealed her story from the beginning; where she started and how she got where she is now. I had been missing for an hour and a half before someone noticed my absence. Almost every resident downstairs seemed to be asking: “Where’s Charlotte?” The fact that my name is Stephanie, and not Charlotte, probably wasn’t much help for those trying to track me down. I had stayed with Frances as long as I could that afternoon, taking in whatever she desired to share with me. I learned that she had to raise four children on her own. She never had much money, and worked several jobs including being a coat checker at a night club and working as a bridal store associate. She laughed, “You name it, I’ve done it!” Regardless of her financial situation, she always volunteered. She single-handedly organized a program for the homeless of the Bronx, and volunteered for 46 years at the exact same nursing home I was volunteering at, before checking herself in four months ago. As I spent more time with Frances I truly began to relate to her. I listened to her tales of a childhood friend whom she still calls three times a day, and to her gossip about nuns and priests running away together. I laughed when she was reminiscing about how she was the best at “spin the bottle,” and took to heart her advice on when is the best time to get married. Ironically, spending time in a place where people are at the end of their lives, taught me a great deal about starting my own. I learned to enjoy every minute of life and each opportunity I am given, regardless of the situation. I was inspired to continue speaking my mind, and to not allow others to stand between me and my goals. Frances taught me that you can always find beauty within sorrow and that helping others is the most valuable reward in life. 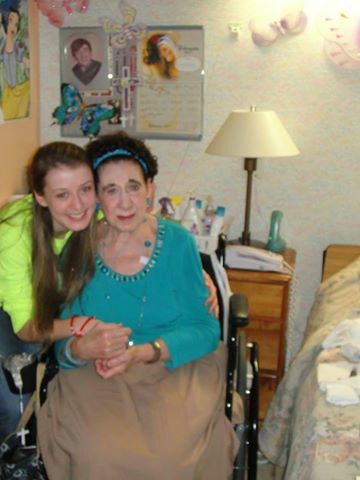 Most importantly, she taught me that in the end, everyone just wants to be loved. It was through her guidance that I could now envision the residents of the old folks’ home as they were in the prime of their youth. I could see the woman who yells in church — tall and beautiful — marching for her rights in Washington, D.C. I could see the man pulling the toothpaste from his pants standing in his Marine uniform, brushing his pearly (real) teeth. I could hear the beautiful singing voices of the women in the back, dressed in the latest fashions, dancing on young and lean legs. I could see the woman with the baby doll cradling a lively, wriggling, infant, an apron tied tight around her waist. They all lived unique lives and had their own stories to tell. My high school, Sacred Heart Academy, always encouraged me to look beyond appearances and instead look into another’s heart. I tried so hard to apply such teachings to my life before, but this mission trip made it a reality. The students at Stephanie’s Alma Mater have shirts designed for almost every occasion, mission trips are no exception. 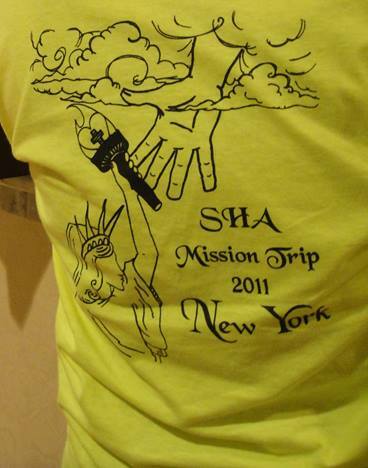 Stephanie designed these shirts for the student volunteers on the 2011 mission trip, although she did not choose the color. Since then I have done service every week and even went on Sacred Heart Academy’s 2012 Mission Trip — this time volunteering to become the leader of the Old Folk’s Home group. I developed many friendships that would not have formed if I chose to not go on that first mission trip. I still think about Frances and wonder how she is doing: what color themed outfit she is wearing today, what stories she is telling to others in her thick New York accent? I still have the package and card she sent me in response to my letter filled with butterflies and paper cranes for her room. These words mean the world to me. Stephanie Baldwin graduated from Sacred Heart Academy in 2012. She now attends Fordham University LC in New York City. Stephanie has continued her love of service by becoming a Social Justice Leader through Fordham, and participating in Global Outreach projects — her most recent trip being a week long service-learning trip to Nicaragua over spring break. Although she is an undecided major, she will most likely pursue a career in creative writing and film.